March has been a big month of change for little ol' me. I transitioned from being a part-time knitwear designer (my other job was a consulting business... my own, so at least I still got to wear pajamas to work some days) to being a full time knitwear designer. It's been a very busy month of designing and knitting samples and I'm excited to share TWO new fruits of my labor with you today. Both of these lovelies are available right here on my website or on Ravelry. When shooting these photos, I had the Hubband, and Ewe Ewe Yarns Heathers' husband, Tom, quaffing beers nearby as we worked. When the men saw this shawl they both agreed that it looked like something out of Star Trek - perhaps a "futuristic interpretation" of an Alien apparel. I had to nod along as I've never watched more than 5 minutes of any one episode but did agree that the shape of it is a bit like the shape on their costumes (uniforms! Sorry... uniforms!). To say I'm obsessed with garter-knit shawls is a bit of an understatement. I love the squishy-ness of the fabric that is created with garter stitch in addition to the AWESOMENESS that is the no-purl project. As a self-taught knitter I'm only now learning how to properly throw my yarn, and still only on the knit stitches. My purling is still a nightmare of awkward slowness that makes me crazy. So the knit stitch, as far as I'm concerned, is where it's at. 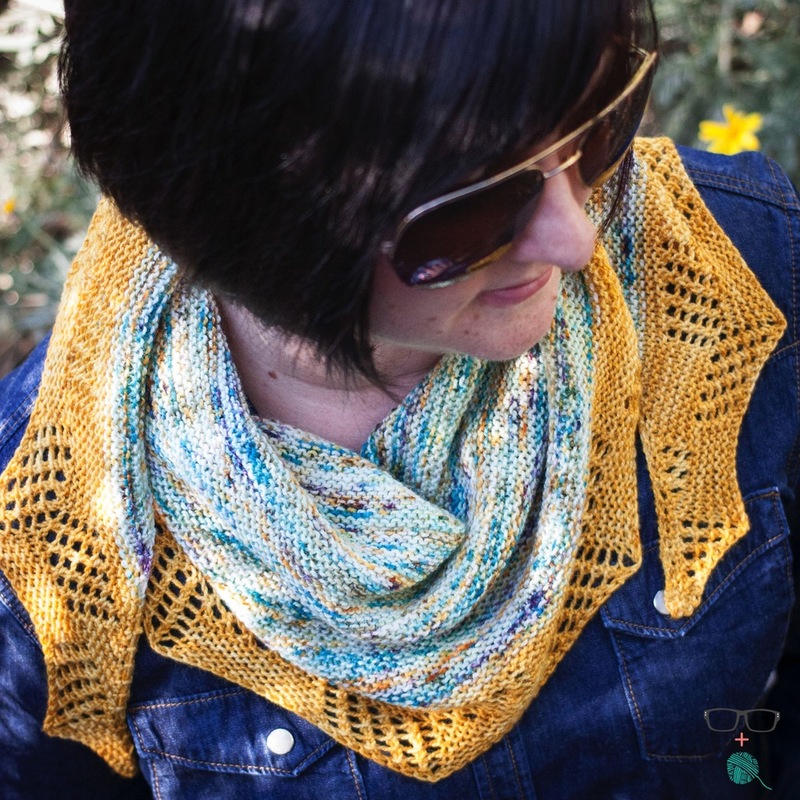 This beauty is worked in 4 colors on a sport-weight yarn and the colors are carried up the edge of the shawl. Double increases on the edges give this a wonderful chevron shape (I believe I read that this is a "German" shaped shawl) so it wraps beautifully in the front as in the pictures, but also hangs comfortably over the shoulders in a traditional shawl style. The second shawl du jour is so spring-y it makes me want to put on a denim skirt and skip around. Albeit I don't OWN a denim skirt but if I did, I'd rock these two together ALL THE TIME! The main color of the shawl was a skein of Republic of Wool gifted to me by my girlfriend, Sheila (@knittysheshe on Instagram... follow her, love her!). I was then lucky enough to meet Michele (genius dyer, knitter extraordinaire and sweetheart owner of Republic of Wool, @kisskisskiddo on Instagram) at the Rose City Yarn Crawl earlier this month and harassed her to dye me up a matching tonal skein. Ummm... she kind of killed it, right? I would have knit this whole shawl in 2 days had it not been for me ripping out the border (LIKE 4 TIMES!) to make it perfect. I'm pretty happy with the end result. 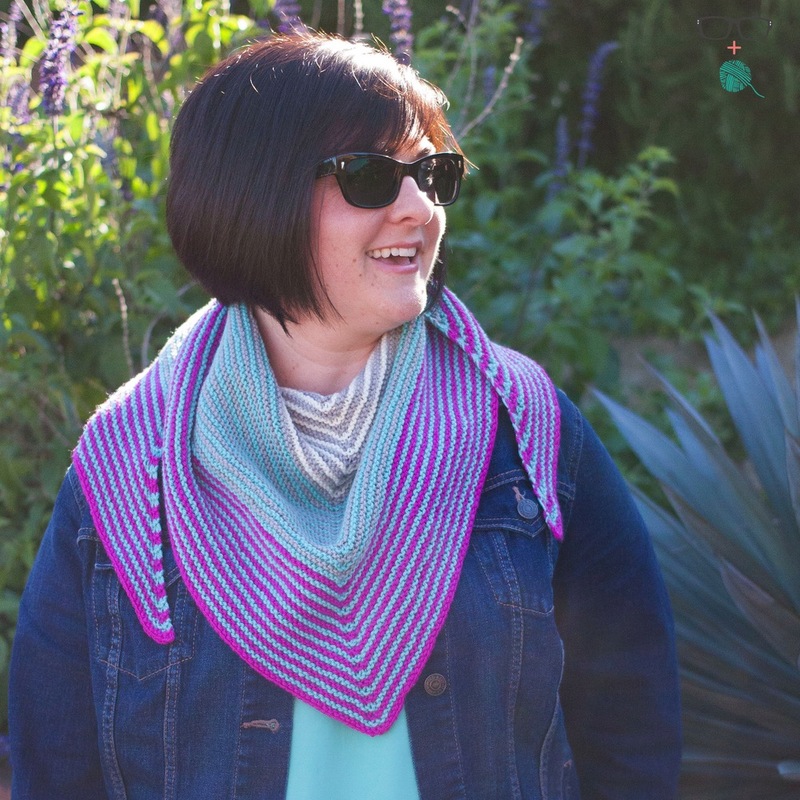 Since I love these two shawls so much, and I love YOU so much, my lovely knitting friends, if you buy both of these patterns together, and enter code "DONTKISSALIENS" at check out you'll get 15% off your order of these two patterns. (discount on Rav only; good until end of day Sunday, March 29th, 2015). I hope you love these as much as I do. Happy Friday - may your weekend be full of lots and lots of knitting!! !